What's that quote about insanity? Doing the same thing over again and expecting different results? It's hard to fault Takuya and company for continuing the fight to save the Digital World. In fact, it's almost admirable that their losing streak hasn't diminished their resolve. Where we have to draw the line, however, is when their insistence on standing ground is spread to innocent civilians. When a group that's just about ready to up and abandon ship is told to stay and fight, it goes beyond courage and into the realm of unnecessary endangerment. At this point it's fair to wonder if this is less about stubborn determination and more about ignorant delusion. The doomed territory of the day is a familiar one- the Village of Flame where we started this adventure. That's a problem, because now we not only have to contend with Takuya's misplaced optimism, everybody is overly sentimental about this place, making them even more determined to save it. 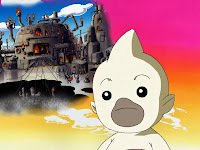 While not unique to this area, there's also the local populace of adorable Digimon who are scared to death of losing their homes. Why haven't they bailed on this place, other than the unspoken point that there's nowhere else to go? They're still here because Bokomon convinced them the Legendary Warriors will make everything right. The area's inevitable deletion adds credence to the notion that the biggest mistake everybody makes in this series is trusting Bokomon. Due to his big book that has more information than we need but lacking anything useful, Bokomon has an air of authority that is somehow never called into question. Who wrote that book? How did he get it? While there's enough in there to make it credible, it is never stated that he received the book from some higher power. For all we know, Bokomon came into possession of it by being the only thing we know for a fact that he is- the world's biggest fanboy of the ten Legendary Warriors. Either he (or another like-minded fanboy) compiled all the known information on the subject or he borrowed the book from the local library (or some ivory tower of knowledge similar to the one we'll see in a few episodes) and never gave it back. This is important because Bokomon has been more of a cheerleader than anything else. He's the one who constantly has faith in the team, not only keeping them in the fight but also convincing his hometown that they'll come through. In other words, he's completely crazy, convinced of something contrary to what reality would indicate. Bokomon is nothing more than that guy who believes that this'll finally be the year the Cubs win it all, yet everybody believes what he has to say! The locals, sensing the reality, have already started to come around by the time the group shows up. 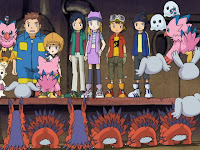 Even though the digidestined were just confused children the last time they were in town, the local population feels like they've been forsaken. 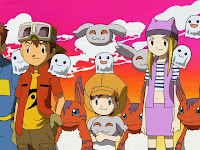 As well they should, given how poorly the digidestined handle the SkullSatamon. Rather than allowing everybody to beast spirit evolve and ganging up on these two, they go straight to the unified spirit evolution, eliminating any possible numbers advantage. EmperorGreymon and MagnaGarurumon land plenty of hits, but both fail to take the opportunity to finish off anyone off, even allowing a third to create a numbers advantage for the opposition! No surprise that Crusadermon claims the data unopposed. And yet, the Legendary Warriors continue to shrug it off, viewing their loss with optimism and strengthened resolve. Of course, we shouldn't be surprised by this spin on events. After all, who's the one writing the book? In fact, he just so happened to take over as narrator this episode. Yeah... we're all in the Matrix now. In reality, Bokomon took over as narrator because Rika's voice actress had to leave the show due to her getting a part in Wicked. I like to think that Bokomon fired her, shouting, “There's no place for sarcasm when telling the story of the ten Legendary Warriors!” She will be missed. Is everybody sick of all the random cutaways to Lucemon in silhouette being all menacing and craving more data? Yeah, thought so. One of the “lessons” in this episode is supposed to emphasize being brave against adversity. The easiest thing the locals could have done is resolve not to tell the SkullSatamon where the data is. And then they go and do it twice. Biyomon ends up getting killed anyway. So much for our “episodes without a death” counter. 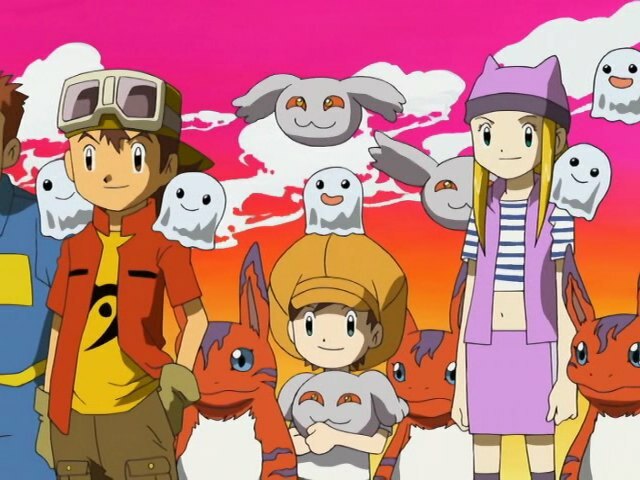 It is appropriate that the Pagumon are the most negative in the group about the digidestined, given that these are likely the same guys who were fighting Koji in episode two. On top of the “unreliable narrator” feeling about this episode, what really sinks the episode into F territory (only the second after part three of the Digimon movie) is the many simultaneous responses from all the locals. It's taking a bad episode and adding a constant stream of irritation to it. Hard to belive Bokomon shares a dub voice with Takato...really, I have yet to hear a Brian Beacock character that didn't sound like Takato (Yumachika, Walker, season 5 Agumon). First "F" of the season. I would've thought there'd be more but hey we still have 7 episodes to go. I keep wondering if SkullSatamon is a Mega level, but apparently not: http://www.dma.wtw-x.net/dexskullsata.shtml. He's an Ultimate. I mean, come on! Why do they keep overpowering them this way!? Cherubimon had a tough time with these two, and now we're expected to believe that these three nobodies put up more of a struggle? Way to make Lucemon look stupid to leave them in reserve. Also agree with the assessment of this episode. 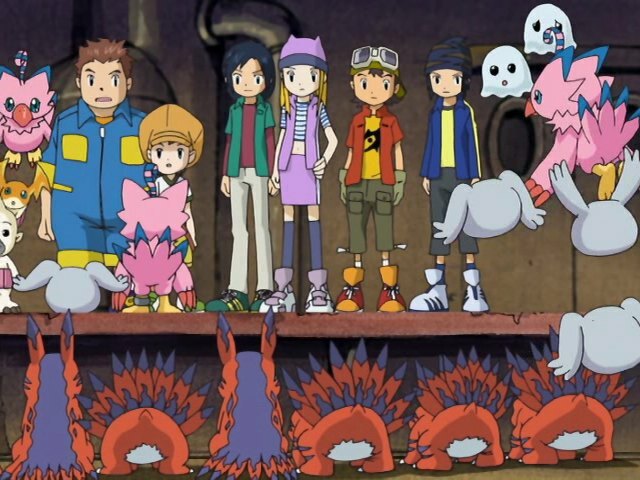 Getting such little Digimon into the mix is foolhardy, and they're only lucky that just one of them got killed. It's like episode 21 never happened. Alternatively, there's Apocalymon, who apparently has a rather variable tree in that he can be a direct evolution of any of four different Digimon...all of which are direct evolutions of Dark Masters. Yes, each of the four Dark Masters apparently has a further digivolution--GigaSeadramon, AncientTroiamon, Chaosdromon, and ChaosPiedmon--and each of these could become Apocalymon. In short, Digivolving levels and who can become what is a confusing mess that's best not thought about too hard.